The jewel in the crown of Blackpool’s entertainment world will celebrate its 125th year, but the future took centre stage at the VIP unveiling of the 2019 schedule. For stars including Coronation Street’s Lucy Fallon, Emmerdale’s Tom Lister and Lady Anne Dodd – wife of one the Grand Theatre’s best loved regulars, Sir Ken Dodd – as well as civic guests, were treated to a glittering glimpse of what is to come and the plans to keep the “people’s palace” going for another 125 years. The audience was welcomed by Blackpool Pleasure Beach’s Amanda Thompson, whose dad Geoffrey was one of the driving forces behind the saving of the Grand Theatre from demolition after its closure in 1972. Amanda said: “At the age of seven my father had me on trams raising money for the Grand and all my life I have been involved in the Grand Theatre. It is a tribute to the people of Blackpool. We saved it and we will look after it. “It’s a fantastic theatre here for the people of the town. I am really proud to be a patron of the Grand – it’s a huge honour. “I remember my father taking me up and down the country as he worked with various managers finding shows to put on. The theme of saving the Grand will continue as the three charities behind it launch an appeal to raise £125,000 for its upkeep and repairs to the famous building’s roof. Grand chief executive Ruth Eastwood then welcomed the three mayors, of Blackpool, Fylde and Wyre and introduced the coming season with a little help from dancers from the Barbara Jackson Theatre Arts Centre, to highlight the Grand’s important role in inspiring the performers of tomorrow. One of those inspired was Lucy Fallon, who started her acting career dancing as a young girl at the Grand and was here in Snow White when she heard she had got a role in Coronation Street. Lucy entertained the audience singing Don’t Cry For Me Argentina. Among the highlights of the coming year will be a special performance in May by star of stage and screen Sir Ian McKellen, who to celebrate his own birthday, his 80th, is touring 80 theatres with his On Stage show and at Blackpool will be giving receipts to the famous Frank Matcham designed theatre. The Grand’s birthday falls in July and at that time the theatre will be showing the famous Agatha Christie whodunnit The Mousetrap which runs from July 22 to 27. Another coup for the Grand is the launch of spooky smash hit The Woman In Black. The company will be using the Grand as their base before heading out on a UK tour. Fylde coast ghost story fans can get their marrow chilled before anyone else, between September 11 to 14. Blackpool lass Jodie Prenger sent her best wishes to the Grand by video as she is rehearsing in Brighton, but she will be gracing the stage in her current show, Abigail’s Party. Mike Leigh’s classic comedy runs from March 11 to 16. A triple bill of contemporary dance is on the menu for March 27, with Awakening from the National Dance Company of Wales, but if rap is your bag, then In the Willows, a hip hop musical with Clive Rowe based on Kenneth Grahame’s classic riverside animals tale, roars into town from April 30 to May 4. The Royal Shakespeare Company will be bringing Romeo and Juliet from February 26 to March 2. Juliet Mills leads the cast in thriller The Lady Vanishes from March 4 to 9 and Nick Hancock will premier his farce Octopus Soup from February 19 to 23. Blackpool mayor Coun Gary Coleman said the people of the area should be proud to support such a beautiful and vibrant asset to the community. 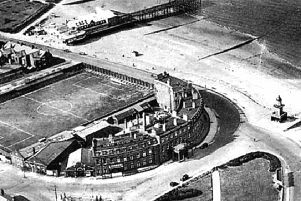 He said: “The Grand really is the jewel in the crown for Blackpool. From a personal point of view I have loved coming here over the years.